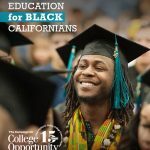 How can California produce more graduates across our diverse communities without a plan? 33 states have goals for higher education. California is not one of them. This is not just an economic crisis that looms ahead; it is a reality for many families today. Is this the California you want to live in? We want a California where the next generation is indeed, better off than generations before. We want a California where students can reliably go to college, finish in a definitive amount of time, and have the skills they need to get a good job. 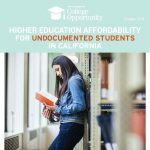 We want a California where college going and college graduation is equally attainable by all ethnic groups and across all regions. We want a California where employers have the workers they need to thrive and stay in the state. 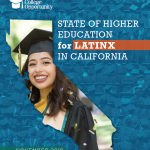 An economically and socially vibrant California requires dramatic gains in the preparation of students for college, access to an affordable college education, college-going rates, and college completion. It is critical to not simply go back to business as usual, but to make strategic budgetary and policy decisions that are aligned with goals that meet the economic and social needs of California. 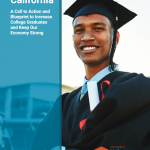 Beginning in 2010, with our One Million More Campaign, the Campaign began to call on the Governor and Legislature to set forth statewide goals close to the college degree/certificate gap. 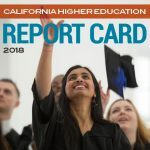 We continue to push for the articulation of goals by the state, and support efforts, such as the CSU Graduation Initiative, by the segments themselves for ambitiously setting their own goals and benchmarks. We have also just completed a multi-city listening tour of the state to garner as much feedback as possible on a draft policy agenda and goals before seeking to refine and present it to the Governor and legislature. Learn more about our listening tour and the feedback we received here.